May 6th, 2018 will mark 40 years since the historic football match, Ipswich V Arsenal FA Cup, May 6th 1978 took place in London, UK. Much has been written about the excitement and hype that took hold of the rural town and how the whole population of Ipswich got behind their local football heroes. The ITFC Heritage Society will be sharing many memories from that special day and I wanted to offer a contribution to that wonderful achievement by I.T.F.C. . Also, The New Wolsey Theatre is teaming up with Ipswich Town Football Club and its’ fans to stage a celebratory musical to mark this anniversary of the club’s famous FA Cup win. In 1978 I was a seventeen year old college student who had a Saturday job working in the office at Woolworths, Carr St, Ipswich. I had been a football fan for some years, enjoyed many games at Portman Road but due to the need to work, it was rare to have a weekend free to travel to watch live local games during the qualifying rounds. The news that Ipswich was in the finals stimulated much excitement and those 50,000 fans that had tickets to travel to Wembley were definitely the lucky ones. Despite not being able to travel to London to watch the match, in a weird way I felt part of the build-up and managed to contribute to the celebratory hype, in a small way. I had been invited by the local newspaper (EADT/Evening Star) to be one of the “local glamour girls” to offer their support to the team. Pressed for my favourite player, I had to say I had great respect for the Capt Mick Mills – his calm persona was a great lead for a team success. Evening Star, photographer, Jerry Turner took me to Belstead Brook for a photo shoot and my “jumping for joy” Ipswich 4 the Cup photograph was featured not only in the local paper but also in the London Evening Standard. On the day of the finals, cup fever was extremely high in Ipswich. Blue and white flags, football rosettes, and scarves seen everywhere. Those working were very sad that we would miss watching the match live. Live TV coverage was on all day. Arsenal were the hot favourites to win but the blue and white, Tractor Boy fans were confident Ipswich would come home with the cup. Amazingly, the management at Woolworth’s recognized this was a truly historic day and made a special announcement to staff during the morning tea-break. The HR manager told all personnel that the management would allow 50% of the staff to watch the first half of the game and the remaining 50% could watch the second half. Each staff member could decide which part of the game they would watch, as long as each department had some staff on duty on the floor or in the office. The lady I worked with opted to watch the first half and I was happy to accept to view the second half as I felt, if we won, I’d be able to see Mickie hold up the cup and be part of the final celebration. As the time for the kick-off approached, the store had less and less customers. I worked in the Ground Floor Change office and had a good view of the main entrance and general shop floor. Once the game started I received no phone calls, there were basically only a couple of people walking around the shop and even less coming to request refunds! At the half-time I was happy to leap upstairs to grab a good seat by the TV and settle down to watch the second half – still 0:0 “Come on you blues”. Spirits were high and even the sternest of senior management had a smile on their face as cakes and tea were shared during the match. Ipswich were definitely dominating the game and with only 13 minutes remaining, David Geddis crosses to local boy, Roger Osborne who fires the ball accurately into the net. Yeah, goal!!! The cries of joy from our staffroom could probably be heard in London. What an amazing experience to feel part of this memorable victory. Everyone was on a high and it was a wonderful atmosphere to feel our modest football club had achieved such success. Well done Bobby Robson and team! You can relive that happy day by watching the game on this link! I’d missed out on seeing the live game but boy I was not going to miss the homecoming. Yes, I and thousands of people crammed into the Cornhill /Ipswich Town Centre to welcome and celebrate with the team as they rode in an open top bus. A fantastic carnival experience that I will never forget. If anyone else some fond memories of this happy day, do please share in the comments below. 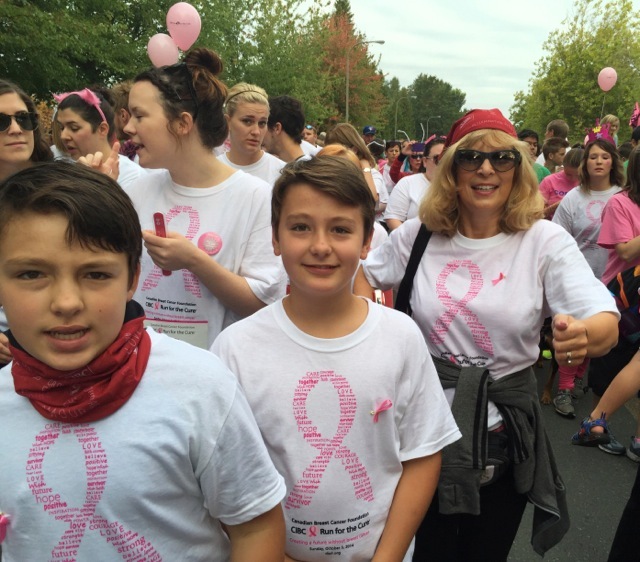 Why Run for the Cure? 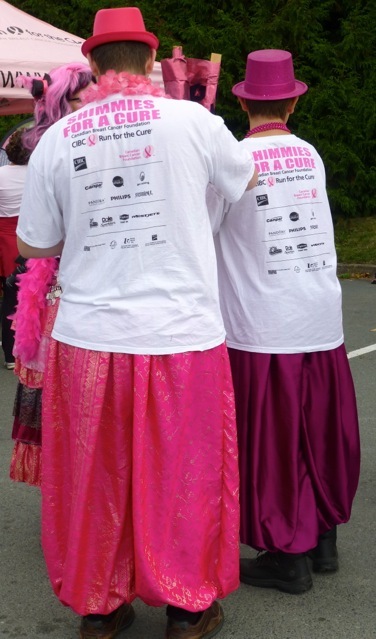 I had the honour to join my husband and his work colleagues to Run for the Cure in Victoria, BC, Canada. Here’s a quick review together with photographs to celebrate our day. If you missed joining or sponsoring this event, I hope you will join us next year! 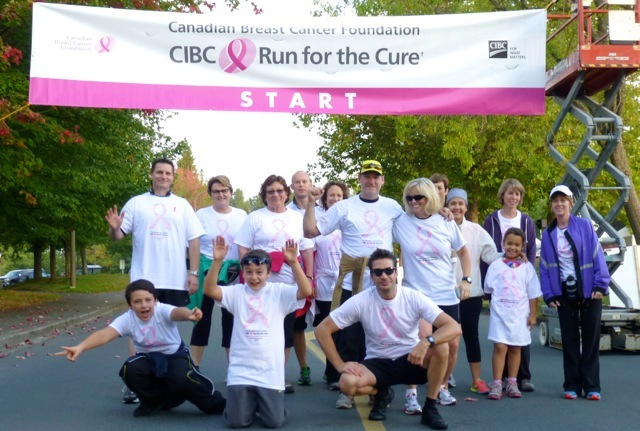 Each year thousands of Canadians participate in the Canadian Breast Cancer Foundation CIBC “Run for the Cure” to help raise funds for important research to help beat this disease. The Foundation has funded $300 million in breast cancer research, health promotion, advocacy, education and awareness programs since 1986. It’s therefore great to report that philanthropy is alive and kicking in British Columbia as tens of thousands joined the effort to raise more funding ($9 Million in Victoria alone!) and participate in the 2014 run around the University of Victory grounds. This included the Hewlett Packard Victoria office that fielded a twenty-five person strong team thus beating their own record for attendance. 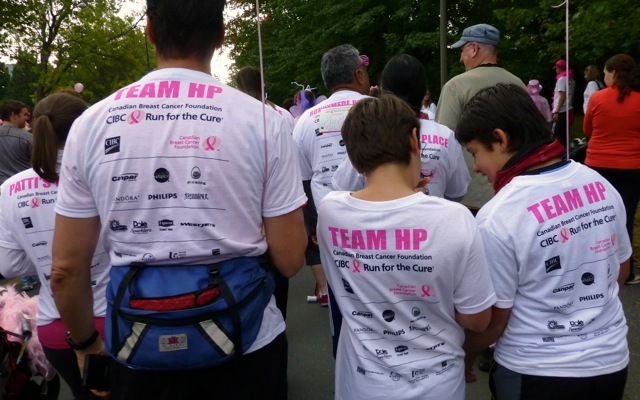 Family members young and old joined HP Victoria staff in the run (jog or walk), whereas across Canada more than 150 HP employees, family members and friends participated. Team HP raised a total of $13,124 in donations for this very worthwhile cause. Way to go Team HP! We all thank Bonnie Gunderson and Amanda Gray who performed a great job coordinating HP’s participation. In addition they arranged team shirts and generally kept up the drumbeat to get everyone to get involved and pumped for the day. The friendly rivalry of “Cowtowners” (Calgary) vs “Islanders” (Victoria), kept the team motivated. A sea of pink clothed people greeted the team arriving to collect their HP Run for the Cure T-shirts. 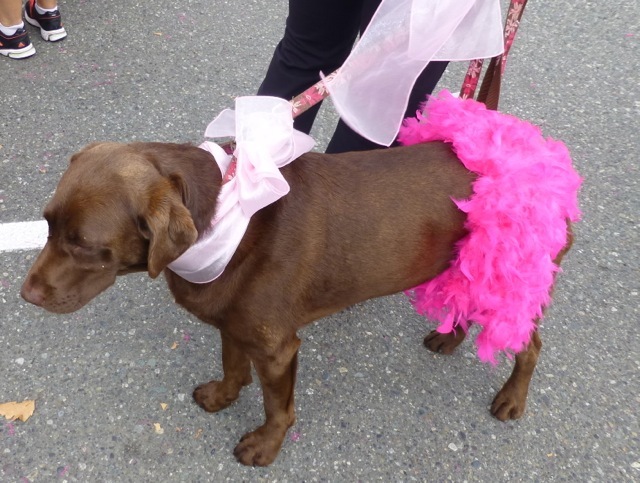 Some participants had definitely gone to town: supporting pink wigs, pink hats, pink dresses and tutus. Some even extended the branding to their dogs and baby pushchairs. A personal favourite were the local fire-fighter team all clothed in pink jump suits. An option of 1 km or 5 km was available for those joining this “fun run” and serious runners were definitely out in force. Likewise people with walking sticks, wheelchairs and those walking with young and old did the event organisers proud. Our own, Ross Kelleway achieved a respectful 29 minute run, though 3 minutes short of his typically best run effort. Clearly valuable early minutes were lost as the dense crowd could only shuffle forward as runners, joggers, walkers and those pushing strollers all battled to push forward and commence the race. One of the youngest members in the HP team, was Richard Arthur’s 11 year old son, Edouard, who achieved an impressive 38 minute result – his first 5 km run, ever and now hooked to take up running. Everyone participating had a reason and a story to share. Many participants were sporting labels on their back to “advertise” why they were running and raising funds for Breast Cancer Research. It brought a lump to the throat and a tear to the eye to read the many tributes being sported such as “I’m running for my Mom”. In 2014, it is estimated that 24,400 women and 210 men in Canada will be diagnosed with breast cancer, and that 5,000 women and 60 men will die from the disease. Morale was kept high with live music played at different points along the route. 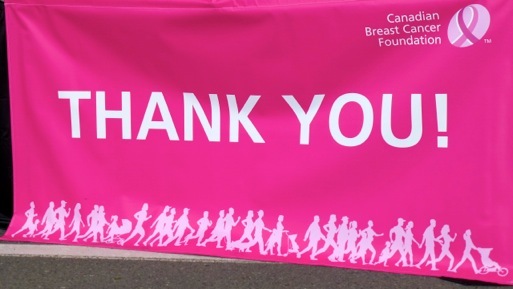 Likewise volunteers, strategically placed along the route, cheered and applauded all the participants. As runners and walkers approached the first 2 km marker the unmistakable sound of the bagpipes could be heard and this definitely helped flagging runners to pick up the pace. A great feeling of relief washed over participants as they reached a “water stop” point and beyond at the final 1 km leg. Everyone participating enjoyed the job of running under the End banner to cheers, waves and well done greetings. The HP team members were thrilled with their efforts. The sun shone early in the race but rolling clouds provided a much appreciate blanket of “coolness” for the sweaty runners effort. All in all a fun morning activity for an important fund raising event. The funding will allow important research, education and advocacy initiatives to be put in place in the coming year. So was it worthwhile for the HP team, Victoria? You bet. On top of all of that, we beat the Cowtowners…Yeah!